When my dad bought this computer it came with a 2.8ghz p4 cpu. I was thinking about upgrading some of the components for more modern gaming but as cheaply as possible. Im checking to see if anyone can tell me if my current motherboard is capable of using a dual core cpu. What exactly is the model number of that Dell? Is it e510 for example? Apparently e520 or newer support upgrades to Core 2 Duo. Even if you can't upgrade the CPU, you might be able to upgrade the power supply and video card and get a big improvement in gaming. The Exact Model as well as the amount of RAM and the Graphics card installed would help. I know thats probably not a new article but does that mean i would be able use something like http://www.newegg.com/Product/Product.aspx?Item=N82E16819116072 , http://www.newegg.com/Product/Product.aspx?Item=N82E16819116052, the dual core celeron e1400? Right now there is 1.5 gb of ram in the system along with a radeon x800. Would a better graphics card be a waste if i dont upgrade the cpu? More RAM would help, especially if you use Vista. A better graphics card would be bottlenecked but you'd still get better performance than now, especially at higher resolutions like 1680x1050. You'd need a new PSU because your current one is around 300W, I believe. Check what's written on the back of the power supply under the heading "12V" and let us know. You might need a new case too - IIRC the x800 is about 7" long and more recent gaming cards are 9" (HD 4850) or even 11" (8800GTX) long. measure your current video card and how much room is still available. THe 945G supports Pentium D processors, but not C2D. 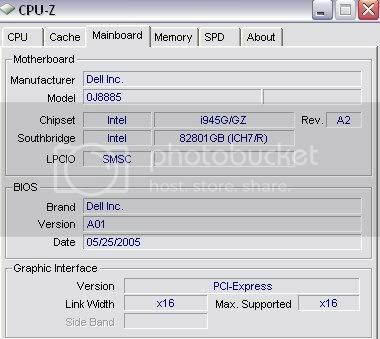 Only some later revision 2 MB's from companys like ASUS released the 945G capable of very limited C2D support. As far as upgrading to a Pentium D, like aevm and others have said, not worth it. The link aevm posted has your answer, build new from the ground up and don't spend any money on the system you are asking about. FYI Pentium D processors are getting very hard to find new. They are not worth the money. Ok thanks. I think ill just save up some money and try build my own system from scratch.